The word hydrosol, ‘hydro’ water and ‘sol’ solution means water solution and refers to the fact that a hydrosol is water containing plant molecules, it is produced alongside essential oil in the process of steam distillation and sometimes referred to as flower water. The term flower water is imprecise as not all hydrosols are made from flowers, they can be made from leaves, whole plants, seeds, roots etc. What I love about hydrosols is that with a small, portable, inexpensive, copper still (from 300 dollars) they are easy to make, much safer than essential oils and have great potential for use both in physical ailments and when working on a more subtle, emotional level. As mentioned above, hydrosols are one of the end results of a steam distillation, the other being essential oils. Essential oils however are only extractable if the still is sizeable (minimum 100 litres for a reasonable quantity) and a large amount of aromatic plant material is available. Most small, portable stills are used uniquely for extracting hydrosols. Water is heated to create steam, which rises and goes through the plant material, bursting the sacks containing the essences. These light aromatic, volatile molecules carried along by the steam into a coil surrounded with cold water (condenser), are then condensed. The steam converts back into liquid released at the end of the process in the form of a hydrosol and in certain cases, essential oil as well. Essential oil is generally lighter in density than water and so floats on the surface of the hydrosol, which often has a milky aspect, giving the French name for hydrosols, hydrolats ‘hydro’ water and ‘lat’meaning ‘lait’ (the French word for milk). Man has distilled plants in order to extract their aromatic core for thousands of years and there is evidence that all the major civilisations used this form of extraction. A clay still found in Pakistan dating back 7000 years is the earliest record we have of this process. Before the invention of stills, plants were heated in water and above them sheep’s wool was suspended in order to capture the steam, the wool was then wrung out and the essential oils collected. Stills used today have changed very little since the middle Ages when the coil was added to help cool the steam through a cold water circulation system. The system itself is very simple (details below), in France, where I live many professional essential oil distillers use basic, hand made stills. Copper is still by far the best material due to its excellent conduction, which diffuses heat rapidly and evenly, it also neutralises hydrogen sulphide and has catalytic proprieties. 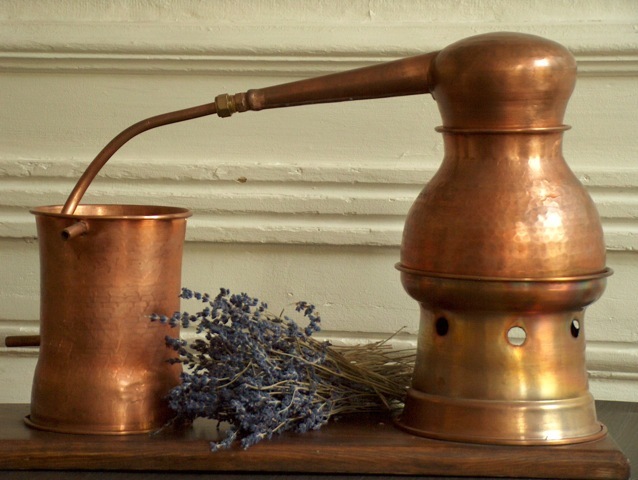 In Europe up until the end of the 18thcentury, the main aim for most plant distillations was to obtain hydrosols, commonly used for medicinal purposes, essential oils being just a bi-product. At the beginning of the 19th century essential oils regained their popularity due to a French researcher, René-Maurice Gattefosse. The story states that after badly burning his hand he developed gangrene and conventional medicine failed to heal him so as a last resort he plunged the wounded hand into a container of lavender essential oil that happened to be in his laboratory and he healed in no time. This triggered off many years of study on his part into the actions of essential oils and their constituents. mentioned for the very last time in 1965. Today some herbalists and distillers are just beginning to become aware of hydrosols in their own right. Professional distillers are starting to market hydrosols; using them to make natural cosmetics and a few small professional distillers are even distilling uniquely for the hydrosol. 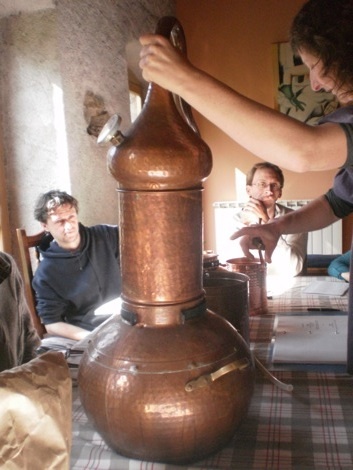 Herbalists are buying stills or grouping together to buy one in order to be autonomous in the production of hydrosols. The realisation that not only strong aromatic plants can be used but very interesting results can be obtained from distilling non-aromatic plants is an exciting one. The three types of plants used are 1) plants rich in essential oils such as lavender and thyme 2) Plants containing small quantities of essential oils (not extractable in stills with a volume of less than 500 litres) such as lemon balm, yarrow, meadowsweet, rose. 3) Plants that do not contain essential oils but produce interesting hydrosols containing organic, volatile constituents such as plantain, nettle, cornflower and horsetail. The quantity of plant material needed is a tiny percentage compared to essential oils. To obtain a litre of lavender essential oil one needs an average of 150kgs of lavender flowers, for a litre of hydrosol, 2 kg of fresh plant material is widely sufficient. (Having said, I have managed to obtain 2 or 3mls of essential oil from a 20 litre still packed full of a strong aromatic plant that has grown in dry, hot conditions) it is also exciting and empowering as a herbalist to be able to produce a tiny quantity of your own essential oil. The precious oil can be separated from the hydrosol with the help of a thin pipette. It is important to clarify a commonly misunderstood assumption that a hydrosol is a diluted version of an essential oil. This is totally false, although they contain between 2 to 5% of the aromatic molecules found in the oil, its principal constituents are hydrophilic (water-loving) and not found in the essential oil at all. During the distillation process two separate and distinct products are produced from the same plant; hydrosols and essential oils. Hydrosols are far less concentrated in plant material than essential oils and therefore as in homeopathy a high dilution can signify a remarkable effectiveness, as much on a physical level as on a psychological/emotional and energetic level. They are also extremely safe, effective and side effect free. Distilling one’s own hydrosols gives the herbalist/wild-crafter another colour in their palette of colours that can be used for transforming wild-crafted plants into herbal medicines. Alongside fresh and dried plant tinctures, herbal teas, powders, flower essences, syrups, balms and lotions we can add hydrosols. It is great being in control of the whole process from A-Z, from carefully wild crafting the local plant material in the right conditions and at the right time, choosing the best, local spring water, distilling with healing intention, bottling and then of course using them in practice. If possible harvest plants on a dry, sunny morning after the dew and according to the corresponding day (flower, fruit, leaf or root) in the moon or biodynamic calendar. Do not harvest on a day corresponding to leaves, as the hydrosols will not conserve as well. It has also been noticed that harvesting on a windy day reduces yields. The right moment to harvest the plant material is simple and logical and corresponds to the same moment one would wild-craft for herbal tea making or tincturing. Rely on your instincts, choose the part of the plant and the moment when it has the most energy and vitality and it is hard to go wrong. For example roses at the beginning of flowering, thyme during full flowering, lavender nearer the end of flowering, flowers such as St-John’s Wort, yarrow and mugwort in full flowering and as near to the summer solstice as possible and as for wild carrot seeds wait until the umbel closes and turns purplish. Most plants are best distilled fresh, although for essential oils there are certain plants that give better yields when pre-fanned such as bay (Laurus nobilis) and juniper this does not really apply when distilling for hydrosols. The choice of water is primordial in obtaining a hydrosol of high quality. Ideally I try to use nearby spring water checking first of course that it is unpolluted, I love the idea of using the water that comes from the same place as the plants but this is unfortunately not always possible. Try not to use tap water, as it will be full of fluoride, chlorine and other such things, buy mineral water or as a last resort filter the tap water. 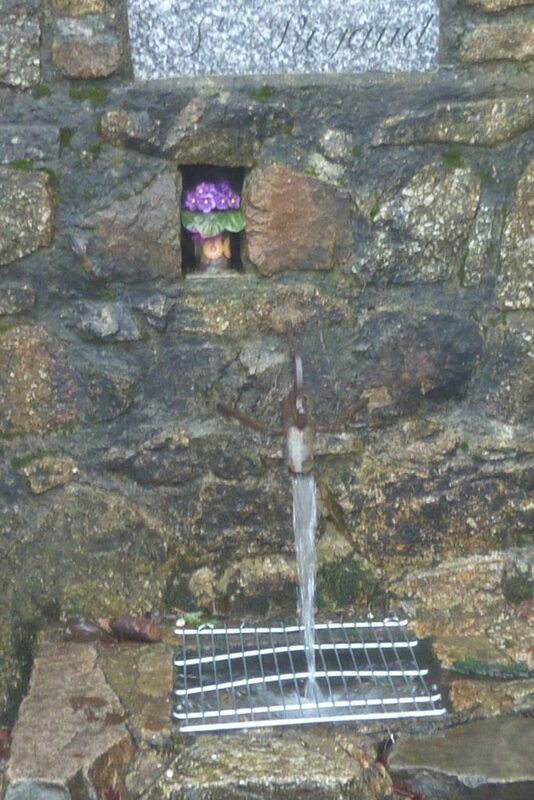 I collect my spring water in a large glass wine vat rather than in plastic and I leave an offering to the spring. Soft, slightly acid water gives better results than hard water. The message held by the water and that contained in the extracted part of the plant marry and together create a new form of expression, the aromatic molecules unite with the water molecules in an ionized form. 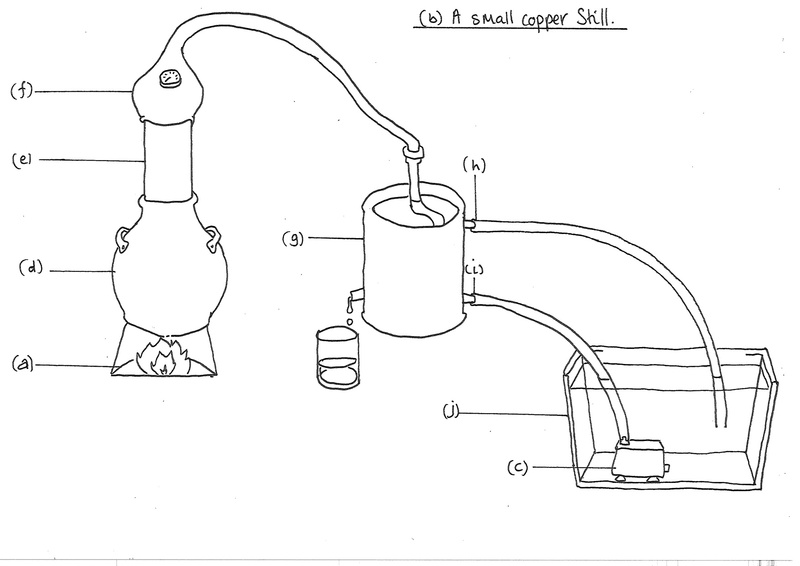 The actual distillation process is also extremely simple, (see diagram below), one needs a source of heat (a) a small copper still (b) as mentioned above, these can be made or bought from anything from 300 dollars upwards on the internet (they are sold as decorative articles in order to get around the laws related to distilling alcohol) and a small aquarium pump(c), the pump is not needed if distilling at a river. The “copper boiler” (d) is half filled with spring water and placed on the source of heat; the column (e) a container with holes pierced into the bottom is filled with plant material and fits onto the copper boiler some stills do not have this and the plants are put directly into the boiler, where there is a grill at the bottom to stop them burning, the onion and bird’s beak cap (f) is then fitted onto the column and joins by means of a screw onto the condenser (g) (column with copper coil inside), there are two tubes leading from the condenser, the superior (h) for cold water and the inferior (i) for collecting the hydrosol. The pump is in a tub of cold water (j), this can be any water as it stays in the condenser and does not come into contact with the plant material, this water is pumped through the cooling system continuously creating a closed circuit; this avoids using too much water. I have often distilled at the river (it is so nice distilling outside in the wild alongside the plants), where there is of course no need to use the pump, the cooling system can be directly filled with water from the river. Once everything is in place, the process takes about an hour, the temperature must near the 100° before any hydrosol begins to appear, most stills have a thermometer on the onion cap, (k). There is something magic about the distilling process in itself, waiting for that moment when the first drops of hydrosol leave the still, somehow another form of the plant has been born…the odour and the resonance are extremely powerful, the plant expresses itself differently, it’s soul is revealed in a new way. Personally I have found through hydrosols a way of deepening my understanding of the plants I have distilled, they seem to give easy access to the plants intrinsic vibration…the rhythm in which they pulse. For example to illustrate this, nettle hydrosol has a deep, very earthed, slow pulsation echoing the proteins and nutritive aspect of this plant and in comparison plantain has a high, fast peripheral vibration which seems to create a protective veil around our physical body…relating perhaps to its usefulness when working with allergies. Although I often feel the plants resonance when making hydrosols, which then becomes part of my information bank about the plant’s healing qualities, this is totally personal and so I decided that I better find some information to back this up. Easier said than done, people talk, like I have here about different hydrosol’s energetic qualities etc. but no one seems to go into detail about why hydrosols behave in this way. I will try to explain simply my understanding of why hydrosols work so well on an emotional and energetic register. 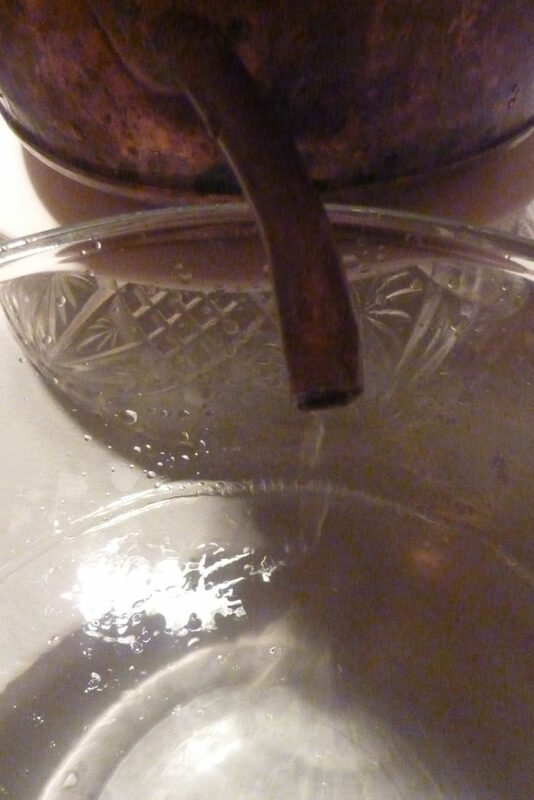 Due to the rise in temperature in the still, the plant material begins to break down in the water and the plant molecules bind to the water molecules. The water then transforms into a gas state, each water molecule will carry with it as much as it can in terms of the dissolved plant molecules. Although the water molecules are limited physically by the amount of plant molecules they can hold, the potency of the hydrosol is also related to the memory of the particular plant and its constituents that have been transferred to the hydrosol by their unique vibrational pulse. So contained within the hydrosol is not only the phytochemical imprint of the plant but also its individual resonant frequency. Hydrosols are very safe and unaggressive to mucus membranes; have no contra-indications, can be taken for long periods without provoking any form of addiction, or interference with other medications and are ideal for babies, children, and pregnant or breast-feeding women. They are perfect for gentle or long-term treatments compared to essential oils that are generally best used on a short term basis considering their concentration in volatile molecules and the pressure these put on the emunctory organs. Their action is also beneficial where essential oils may be too aggressive for example with skin problems such as eczema or psoriasis, or where the essential oil in itself is too dangerous such as in the cases of tansy or sage, that are prohibited in France, the hydrosols however are completely safe. Hydrosols can be taken easily both internally and externally without having to take any great security measures. I advice between a teaspoon and a dessertspoonful in a glass of water or added to a herbal tea at least three times per day for internal use, this can be continued for 21 days, if treatment needs to be prolonged, have a week off and then repeat the same thing for 21 days. For external use hydrosols can be applied neat on a piece of cotton wool, I have also found it very practical to pour them into a spray bottle and spray the affected area. Keeping to the two hydrosols referred to above, plantain and nettle, here are a few examples of how I might use them in practise. Plantain Hydrosol – any of the three common plantains, Plantago media, Plantago majus or Plantago lanceolata can be used although my personal experience refers to Plantago lanceolata. When I have the choice I always use this one, it seems have more sharpness and be slightly more fine-tuned than the other two but that is just a personal thing. A bottle of hydrosol on hand for external use is great when dealing with insect bites, stings, blisters and other allergic reactions, I have also used it with good results as a face-wash for acne. It is effective as an eyewash for ocular infections and irritations. For patients suffering from chronic weakness and sensitivity of the eyes a hydrosol mix of cornflower (Centaurea cyanus), greater celandine (Chelidonium majus), german chamomile (Matricaria recutita), sweet clover (Melilotus officinalis) and Plantain is very useful. Plantain’s antibacterial, anti-inflammatory, emollient and astringent proprieties can also be beneficial when used internally in the form of a hydrosol for problems related to the respiratory and digestive systems. I also use it to accompany other treatments including plantain (tea and tincture) for hay fever, I fond that having a spray bottle of plantain on hand at all times and using it regularly helps to diminish attacks and acts as a protective barrier. Nettle Hydrosol – everyone loves nettle and there is so much one can do with all the parts of it from making great soup, to weaving fibres from the stems, to helping enlarged prostates with the roots, to using the whole plant to make a fermented extract as a garden fertilizer, to adding them to herbal teas for their mineralising proprieties and much more. So what does nettle hydrosol do that can’t be done with nettle tea or nettle tincture? I have found that nettle hydrosol is very useful when considering nettle’s anti-stress or adaptogen-like proprieties, it earths and help the person pace him or herself. Like the story of the hare and the snail, the snail won the race as he knew how to carry on steadily at a pace that suited, nettle hydrosol brings this type of resonance. I also use nettle hydrosol externally, as a hair treatment, it fortifies and brings shine to dull hair and used on the skin, tones and helps regulate sebum thus being an excellent allay for acne and related skin problems. Making one’s own hydrosols and being a part of the process from the harvesting to the final product is not only easy with a small home still but also extremely revealing. The plant seems to open up on another level allowing us to come into contact with its healing vibration with ease and clarity, thus deepening our knowledge and intuitive information about it. There is a time for everything and although there are herbalists that have been distilling and using hydrosols regularly for years, I believe that now is the time to integrate their use into regular practise, they do not replace other forms of plant preparation but as already mentioned, add a precious element to our herbalist’s tool box. 1) Dr Jean Valnet – (1920-1995), military surgeon who tested the beneficial effects of essential oils on the war field. 2) Pierre Franchomme – Aromatherapist, pharmacologist and founder of the International Aromatherapy School. 3) Dr Penoel – Essential oil researcher, aromatic medicine practitioner, educator and author.